Apex tools should be your choice when you want world-class products that you can trust to be reliable and effective for any job. Businesses in Kansas City, Wichita, Dallas, Fort Worth, and surrounding Midwest cities that want to acquire durable, well-crafted Apex tools should turn to the experts at Wm. F. Hurst Co., LLC. 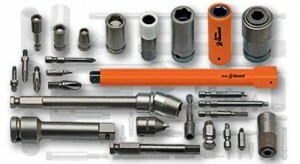 We not only offer an unmatched selection of products from the Apex Tool Group, we also offer unparalleled customer support from experienced professionals with expertise across a wide range of industries. Our knowledgeable sales associates have in-depth knowledge of all the tools in our inventory and can make product recommendations for a variety of applications. Our goal is to help our customers identify the tools they need to improve processes within their operations, and then to provide those tools quickly and at highly competitive prices. Contact Wm. F. Hurst today to learn more about our selection of Apex power tools for businesses in Kansas City, Wichita, Dallas, Fort Worth, Springfield, Joplin, Columbia, and other cities throughout the Midwest. Also, inquire about our CribMaster inventory management systems and how they can help prevent tools being misplaced and stolen, and avoid overstocking tools, which can lead to cost savings.